We’ve heard that many of you would like more opportunities for Enneagram Narrative workshops in your local area. And we’re ready to make that happen! Enneagram Studies in the Narrative Tradition has launched a Collaboration Initiative designed to make our teachings more accessible to people throughout the U.S. and Canada. You’re invited to join us in bringing an Enneagram Narrative Weekend with one of our Core Faculty members to your community. 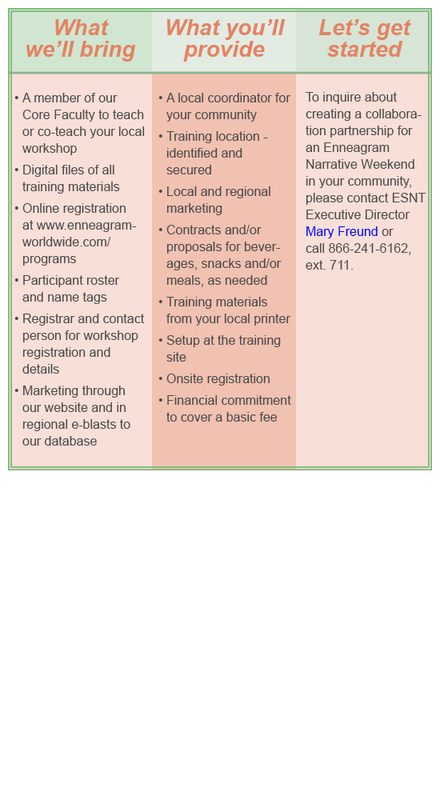 Each local weekend workshop will be co-designed as a cooperative agreement between ESNT and the organization or individual who wishes to co-sponsor an event in their city. Working together, we will design an agenda for the Enneagram Narrative Weekend that meets your specific needs. In addition, the Core Faculty member presenting the workshop will be available to meet with a group organized by the sponsor to explore how to build your local Enneagram Narrative Community, develop follow-up classes, and more.